Veronza Bowers, Jr. 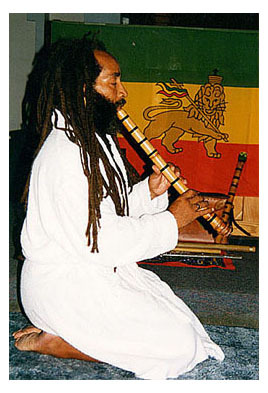 Founder All-Failth Meditation Group, a prison religious organization devoted to healing meditation using the Japanese shakuhachi flute. the family & friends of Veronza Bowers, Jr.
who are solely responsibe for its content. Veronza Bowers Jr. is an inmate at the Federal Correctional Facility in Atlanta, Georgia. He is a former member of the Black Panther Party incarcerated in federal prison for over 37 years making him one of the longest-held political prisoners in U.S. history. In the 37-plus years of his confinement, Veronza has become a "model "prisoner. He is an author, musician, a student of Asian healing arts and has a strong interest in Buddhist meditation as well as "hands-on" healing techniques which he practiced at the various facilities in which he was incarcerated. Veronza is also an honorary elder of the Lompoc Tribe of Five Feathers, a Native American spiritual and cultural group. He is a mentor and founder of the All-Faith Meditation Group, a non-denominational spiritual organization devoted to healing meditation using the traditional Japanese shakuhachi flute. Why was Veronza sent to prison over 37 years ago? Veronza was convicted in the murder of a U.S. Park Ranger on the word of two government informers, both of whom received reduced sentences for other crimes by the Federal prosecutor's office. There were no eye-witnesses and no evidence independent of these informants to link him to the crime. At his trial, Veronza offered alibi testimony which was not credited by the jury. Nor was testimony of two relatives of the informants who insisted that they were lying. The informants had all charges against them in this case dropped and one was given $10,000 by the government according to the prosecutor's post-sentencing report. Veronza has consistently proclaimed his innocence of the crime he never committed — even at the expense of having his appeals for parole denied — for which an admission of guilt and contrition is virtually required — he insists on maintaining his innocence. The Black Panther Party was targeted by J. Edgar Hoover and the FBI in its infamous Cointelpro Operation which, during its years of operation from 1956 to 1971, surveilled, infiltrated, manipulated and tried to provoke criminal activities by entirely lawful civil rights and peace demonstrators exercising their First Amendment rights to oppose government policies. Hoover referred to the BPP as "the greatest threat to the internal security of this country" and authorized surveillance of many black and antiwar leaders including Martin Luther King. Despite letters of support from prominent attorneys, former high-ranking representatives of regional commissions, prison officials and a member of the U.S. Congress, Veronza has continually been denied release due to intervention by the U.S. Parole Commission. A recent decision by the regional federal parole commission to grant his release was overturned by the National Commission. With the truth coming out daily about the high incidence of inmates who have been falsely convicted and imprisoned, exonerations of Death Row prisoners (156 to date), police and prosecutorial malfeasance and other failures of the criminal justice system, Veronza's case deserves careful review.
. . . and still be held in prison for 16 moths after this sentence expired? June 21, 2005, was the day Veronza Bowers was to be released from federal prison on mandatory parole after more than 31 years of incarceration. This date was based on a vote of the five-member U.S. Parole Commission in Washington, D.C., the highest governing body in our nation's parole system. We just learned that, once again, at the very last moment, Veronza's release has been cancelled. This action was based on a petition filed by U.S. Attorney General Alberto Gonzales requesting that the National Appeals Board "reconsider" their decision granting him parole. The USPC has, thereby, "retarded" Veronza's release (no pun intended) "for a period not to exceed 60 days". This order for reconsideration by the Attorney General was made at the behest of a law enforcement group called the Fraternal Order of Police (FOP). Our legal team strongly feels that this unprecedented action on the part of the USPC is totally illegal and based on no credible evidence whatsoever. It violates the Commission's own guidelines and procedural regulations. The rule of law that should guide the Commission in this case has clearly been undermined by political pressure exerted at the highest levels of the current administration. The truth of the matter is that Veronza has served his full sentence under law plus 16 months of illegal detention. He has been a model prisoner with the highest possible Bureau of Prison rating and recommended for parole several times, only to have his release rescinded, literally, at the last minute. He received a very favorable review and recommendation for release based on rigorous psychological and personality testing administered by a highly-reputable independent agency. His petitions for parole have been strongly supported by a number of prison officials and administrators who worked closely with him over the years and can't say enough about his role as a mentor and role model to younger inmates. His efforts to be released have also been supported in writing by a former member of the USPC, head of the NY Parole Commission and a member of the U.S. Congress. Over the last three decades, he has worked hard to improve himself in all ways possible—personally, socially and spiritually. Yet, he continues to languish in prison, be subjected to threats and intimidation, demeaned by the news media and falsely accused by the very group that claims to be the guardian of law and order in our society. Today is a sad day for America and for the spirit of democracy in our land. Learn more about this latest travety of jusice. Based on legal filings, private documents, e-mails and interviews. A Magistrate Cited Bias in the Case of Veronza Bowers Jr.
What do Prison Administrators and Unit Managers who work day-to-day with Veronza have to say about him?
" I have known inmate Bowers for-the best I can pinpoint-approximately 17 years . . . . I have been with the Bureau of Prisons for 25 years in March and this is my first time ever speaking on behalf of an inmate.
" As I said, I have known Bowers for approximately 17 years, maybe even more, but it's very unusual having come through the ranks as a correctional officer, a lieutenant, a captain-I have worked in the regional office, I have worked in the central office, I have been a disciplinary hearing officer, and now I'm a unit manager. It's very unusual to run into an inmate who can do five years, ten years, 15 years, 20 years, 21 years is the exception, and this is exceptional that the inmate could conduct himself in an institution in such a manner as not to even receive an incident report. Incident reports are very easy to get and he has set the standard for not getting any incident reports. I can address the fact that as a Bureau of Prisons employee, we all wish we had an institution full of inmates who can go 21 years without an incident report.
" And I will just reiterate one more time that in 25 years, almost, with the Bureau of Prisons, I have never done this, but when he asked me to come speak to you today, I didn't hesitate a second. I think it's worthy to note that he's been around this long and done this good in the Bureau." " The Skills Program is a pilot program . . . designed for inmates that are actually special needs for low-functioning learning disabled. They can't have a GED or to be in the program and . . . usually can't even read. A lot of them probably won't ever be able to [get a GED], but we're improving their skills so they can function better in prison and upon release, like getting a job and teaching them social skills like communication and anger management, problem solving.
" We have counted on the mentors to live with the students and Mr. Bowers has been someone that we've counted on to handle our most difficult students, the problem inmates that get frustrated easily, that have very poor problem solving.
" Mr. Bowers has been a role model in the unit and the inmates will listen to another inmate more than staff. They kind of believe he's been there, he understands, and he's been very helpful in that program.
" He lives with the student. He helps them academically with their homework, teaching them to read, arithmetic and anything else. He goes over the problem solving [and homework] in those classes.
" He does the meditation class in the chapel as well as on the unit. That's been helpful for inmate to relax. They really enjoy it. [Mr. Bowers} established with the chaplains and the recreation department a meditation program . . . and he is the primary facilitator for that group. . . . He's been a positive role model in that program. I have always heard him be very respectful, very appropriate to staff and inmates." Would Veronza be a "Threat to Society" if released from prison on Mandatory Parole? On December 14, 2004 Mr. Hans H. Selvog, M.S.W., L.C.S.W, a licensed clinical social worker and Clinical Director of the Augustus Institute (National Center on Institutions and Alternatives of Baltimore, Maryland) submitted to this Commission a forensic assessment of Veronza Bowers, Jr. concerning his current suitability as a candidate for parole. The exhaustive evaluation consisted of a mental status exam, psychological testing and risk assessment. It also reviewed Mr. Bowers’ behavioral adjustment record while incarcerated. “ Other than the offense of conviction, Mr. Bowers had no prior criminal record. In my estimation, he openly and honestly discussed his institutional adjustment and incident reports to the fullest of his ability, recounting from memory 31 years of experience. It appears that the overwhelming majority of his confinement is without violation while replete with prosocial accomplishment. Aired on radio station KZYX on Sunday, December 29, 2002. You can hear the entire program now by clicking on the link above.